How do I keep the birds OUT of my grapes? This month’s question came from multiple people; time to talk about it since it is a perennial problem for fruit gardeners everywhere. How can I keep birds off my grapes? Bunch grape clusters are filling out right now and will start ripening soon. 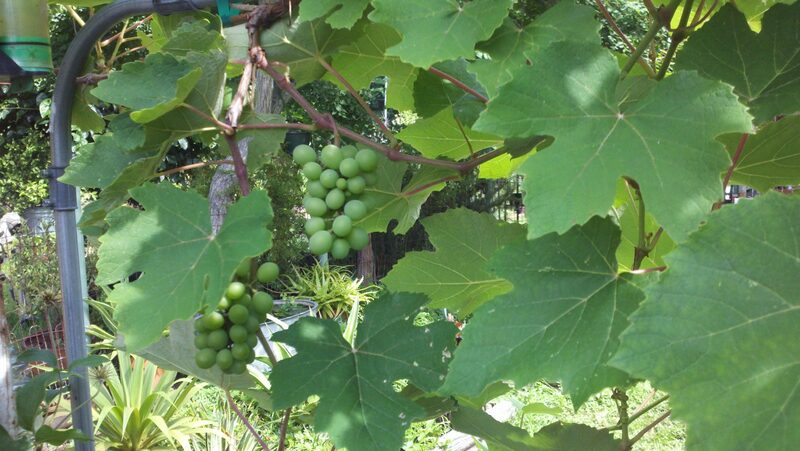 Muscadines form smaller clusters and follow the bunch grapes in the ripening sequence. Birds like the grapes slightly before they are ripe enough for us to eat. We can’t solve this problem by harvesting early because grapes do not ripen off the vine. They must remain on the vine until they are fully table ripe, and the window from ripe to overripe is fairly short. First off, let me say that it is not easy to defend your grapes from hungry birds, but it is doable. I have tried several solutions, each solution with its own advantages and drawbacks. Let’s discuss a few options; then you can select the one that seems best for you. Bird netting has been the go-to solution for years, and nets work fairly well. But some birds, especially mockingbirds, seem to find their way in anyway, and once they do, they can decimate a crop quickly. 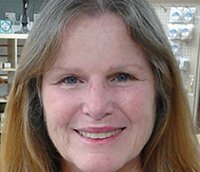 You can run into troubles if you drape the netting directly on the vine. The birds can still see the grapes and they can often find a way to reach through the net to harvest them. You can also end up with a tangled mess of net, vine, leaves, and tendrils that will be frustrating to deal with after the harvest. If you want to use netting, make sure it is sized properly – ¾” will stop most birds, but ½” stands a better chance against our smaller birds. 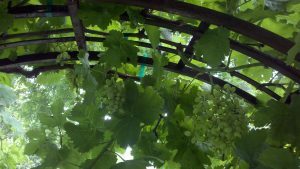 It’s also best to install T’s made of PVC pipe or 2×2 lumber that stand OVER the vines so the netting can be draped over these T’s where it won’t tangle with the vines. And make sure to remove it immediately after harvest. The nets serve no purpose other than protecting fruit. Leaving it for even a week or ten days can make the task of removing them more difficult. 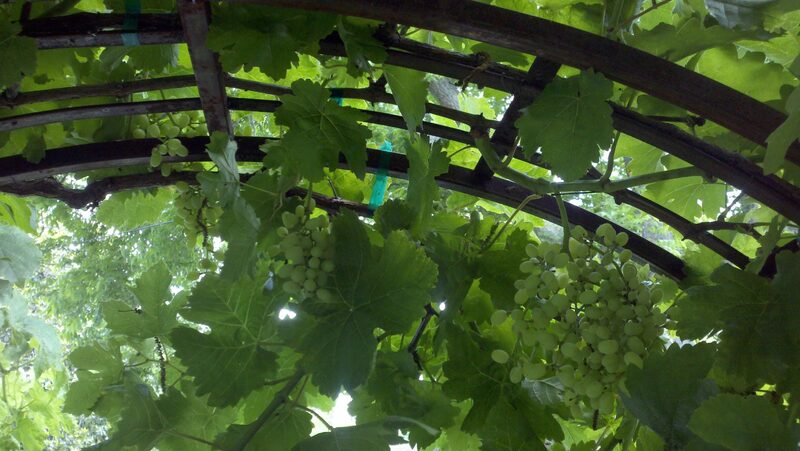 Another issue facing home fruit growers is that our grapes are not always on standard, straight-row grape trellises. They are often on arbors, ornamental trellises, pergolas, or patio covers. Grapes on these structures are almost impossible to net. We need other options. Shiny metallic tape and spinning pie pans are often recommended. But as soon as the birds figure out that they aren’t a real threat, they help themselves. I haven’t found that they are very effective for grapes. Mechanisms designed to make noise or spray water interrupt the serenity of the garden, so for me they are not an option. 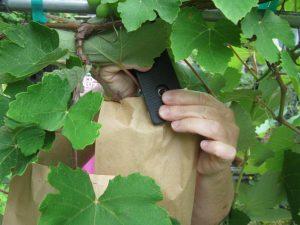 Plus, many of us are using grapes in multiple places in our landscape and we would need too many gadgets to cover them all. 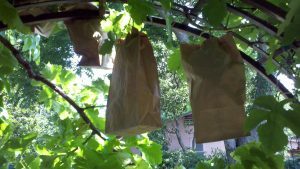 Last year we started using a method adapted from organic apple growers – paper lunch bags. These bags come in large quantities – 100 to a package. They are very inexpensive and infinitely disposable in the compost pile. Even though they are lightweight paper, they do withstand normal rainfall for the time period they will be on the vines. They take less time to install than a net and there is no post-harvest hassle. They also allow the clusters to breathe. To install the bags you will need a stapler. If you can get one with a narrow nose it is easier, but any hand stapler will do. Just slide the bag over the cluster until the top edge of the bag is over the stem of the cluster. Center the bag and staple one side close to the stem. Slide the stapled edge tight against the stem, and staple the other side. That’s it. You would be surprised how quickly you can bag all of the clusters. Two people working together can do a vine in minutes. Once all of the clusters are bagged, your vine will look a little like you have hung a row of luminarias on it. 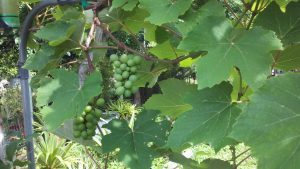 Don’t do this too early in the season; wait until the grapes are gaining size and you suspect they are ready for final ripening. We are just trying to dissuade the birds during the final ripening to table sweetness. You can’t see through the bags to see ripening, but you can cut a slit in the bag to look for ripeness, and staple the slit closed again. You won’t have to check every cluster – as soon as one looks ripe, then you can start checking the rest. You can also leave a small cluster uncovered as a tell-tale cluster for when to start checking. Yes, you can use this method on other fruits. The bags can be stapled over stone fruits and pome fruits. Stone fruits have a shorter stem than apples and pears, so some adjustment is needed, but it works. Ripeness on stone fruits can be tested without slitting the bag since you can feel when they begin to soften right through the bag. You will have to slit to check apples and pears, but it’s quick, and much more satisfying than having a basket of bird-damaged fruits. The only drawback to this method is that it does not stop squirrels. If they get really curious they will tear the bags. But it does cut down on their curiosity – out of sight out of mind? One way or the other, we do find that it cuts down on their damage, too. For berries and figs we still use netting draped over PVC T’s. They are just too prolific to make it practical to bag all of the fruits. However, if you need a few perfect figs for a special occasion dessert, you could certainly bag what you need. The bags can also be cut in half to suit smaller fruits and to extend the quantity. The cut end can be taped, glued, or stapled to form a new bottom. One thing we have not tried is using kaolin clay. I am wondering if spraying the clusters would camouflage them from the birds. Kaolin clay is non-toxic and is used to deter insects and to provide a slightly reflective coating to cool trees down in harsh sun areas. I don’t know how hard it would be to wash off of a grape cluster but it comes off apples and peaches well with a cool water and vinegar wash. If it does as well with the grapes, it’s worth a try. I’ll let you know if it works. If you have any questions about this blog, or have a question you think would be useful here, email me at [email protected]. EXCELLENT idea Angela! Never heard of "bagging" but it makes TOTAL sense! Thank you so much. I let the birds eat all they want and I get plenty for myself and to share, don' sweat the small stuff. Hi Angela, I just stumbled across your great blog. I live between Bryan and Austin in acid sandy loam. We have the muscadine along the fence lines along with dew berries. When I have time and when the neighbors have not sprayed herbicides or commercial fertilizer I get far more dew berries than I could ever pick, eat or store. Not so with the grapes. ALL of them disappear before ripening. We have wily crows here that can strip a pecan tree in a day. Next year I will try the bag trick. I worry that our periodic high winds may blow the bags off but perhaps not for the relatively short time they might be on. The grapes are far away in the outer field so it's hard to monitor ripeness but I love the bag idea. When do your grapes usually get ripe enough to bag? September? Text extremely hard to read. Crows are eating the green ones! Gonna try bago ty! Just took my dogs out crows were pigging oit! Thought I was gonna have too many grapes on my single but thriving grape vine! Crows are eating the green ones! Gonna try bags ty! Just took my dogs out crows were pigging out! Thought I was gonna have too many grapes on my single but thriving grape vine! protecting net is very easy but more beneficial and inexpensive method to control insect and birds .we used mash bag and gaining maximum yield without loss. We have never been able to use our grapes because of birds and squirrels. This year I bought reuseable produce bags (earth wise) at our Kroger store. Took out the ties and cut them in half lengthwise. Turned them inside out. Serged the cut edge, but not the top string area. (Sewing would also work). Cut the strings in half and re inserted. Bagged about half our grapes. Beautiful harvest. The birds didn't go for the unbagged grapes either. I think the white bags scared them. The mesh is tiny. The bags breathe but even small bugs couldn't get in. For our largest grapes I used 2/3 of a bag. Today I noticed fruit flies on the unprotected grapes. They couldn't get in the bags. When I tied the bags I did it around the main vine , not on the bunch stem. This gave better support. Forgot to say, bags like new. Ties easy to undo. Ready for next year. The bags are very reasonable. Thanks for the paper bag idea. That sounds great. I am so tired of the netting. What kind of spray would you use for bugs on grapes , and when ? Catawba grapes . No. Paper always over plastic. The plastic will hold moisture and heat, rotting the fruit. What are your thoughts about blue berries? Im in Michigan, loosing my first nice crop to birds. Going to bag up my grapes this week to at least get that crop this year. Thanks so much for the bag idea- fingers crossed! I was just going to buy netting and you saved me the expense and sounds like frustration. Michigan Beekeeper! Thank you for the idea of reusable produce bags that are made from a netting to allow air in. I tried bags sewn out of white row cover cloth and squirrels tore through the cloth and ate the grapes. I was thinking of a metal mesh that would be flexible enough to mold around the grapes but wouldn't damage them. I have been using pop socks natural tan colour successfully to protect my grapes for the last two years. They stretch as the grapes grow. They let the light in. Keeps the insects and birds off! I buy the cheapest I can. Usually the ankle length ones. Does look hilarious and neighbours must think we are mad though!